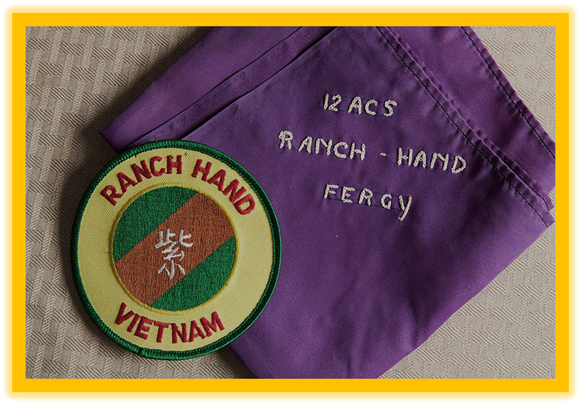 Vietnam vet Gary Ferguson’s scarf and patch from Operation Ranch Hand. A lot of Vietnam veterans wonder whether they were exposed to toxic herbicides like Agent Orange during the war. Mr Gary Ferguson of Omaha doesn’t have to wonder. He knows he touched it, ingested it and repeatedly got sprayed with the stuff during his year as an enlisted aviation mechanic with the Air Force’s Vietnam War defoliation program, Operation Ranch Hand. Thousands of Vietnam veterans with a fraction of Mr Ferguson’s exposure to chemical herbicides are now collecting disability benefits from the Department of Veterans Affairs [ VA ]. BY LAW, THE VA PRESUMES THAT THEIR DISEASES ARE LINKED TO THEIR WARTIME SERVICE. That grinds at Mr Ferguson, who at 71, is tanned, trim and healthy. He still works full-time as maintenance supervisor at Grace University. He is especially unhappy that veterans are lobbying for VA benefits for what he considers DUBIOUS CLAIMS THAT THE ILLNESSES of their children and grandchildren are somehow linked to Agent Orange. Yet experts argue that the good health of even heavily exposed veterans like Mr Ferguson doesn’t necessarily disprove the link between Agent Orange and deadly diseases. « It’s important to look at the totality of the evidence, » said Dr Kenneth Ramos, interim dean of the University of Arizona College of Medicine-Phoenix. Dr Ramos heads an Institute of Medicine committee of medical experts tasked with reviewing the body of research into Agent Orange — which contains dioxin, a potent carcinogen — and other chemical defoliants. The committee advises the VA on the strength of evidence connecting Agent Orange with a long list of diseases, including certain cancers, diabetes, Parkinson’s disease and immune disorders. « The line is drawn on the strength of the evidence that emerges from these studies, » Dr Ramos said. Mr Ferguson grew up in a small town west of Chicago. Expecting to be drafted, he enlisted in the Air Force in 1965 because he was interested in missiles. But the Air Force trained him instead as an aircraft mechanic and sent him to Vietnam. In October 1966, he was assigned to Ranch Hand and the C-123 cargo planes that sprayed herbicides over large swaths of South Vietnam from 1962-1971. With so much focus on the health effects of Agent Orange, he believes that people forget how much Ranch Hand flight crews risked to clear the jungles. Mr Ferguson figures that he soaked up Agent Orange on an almost daily basis. He and his fellow crewmen wore NO gloves, goggles or protective suits. « A lot of times you DID NOT even wear a shirt, » Ferguson said. Ferguson left the Air Force in 1969 and moved to Omaha in the late 1970s. In 1982, he was one of 1,245 Ranch Hand veterans who joined what is still the largest study of Agent Orange’s health effects on U.S. service members. It lasted for 20 years. Six times during that period, Mr Ferguson and the other participants received thorough physical exams and filled out lengthy health questionnaires. They were compared with a control group of Air Force veterans who served at the same time but who DID NOT handle herbicides. What came to be called the Air Force Health Study produced a trove of epidemiological data. « It’s definitely an important study, » Dr Kenneth Ramos said. • Dioxin is a risk factor for cancer. • Ranch Hand veterans DID NOT develop heart disease any more often than their peers, but they were more likely to die from it. • There was NO correlation between herbicide exposure and leukemia. • Ranch Hand veterans were more likely to develop diabetes. Those with higher levels of dioxin in their systems developed the disease faster, and their cases were more severe. • They found NO apparent link between birth defects and paternal exposure to Agent Orange. Still, the study had its limitations. Some critics doubted that the Air Force could objectively conduct a study that might reflect badly on its own program, and reviewers criticized long delays in releasing the findings. They also said the study should have included Army or Marine ground forces who were exposed to Agent Orange. Dr Ramos said one big problem is that scientists can’t measure how much dioxin was in the bodies of service members before they arrived in Vietnam. And they can’t reliably measure how much a given veteran was exposed to during the war, or in the decades since. Dioxin is present in the environment, after all, and we absorb it — especially in the food we eat. « It speaks to the high levels of uncertainty when you’re trying to reconstruct the past, » Dr Ramos said. Until the passage of the Agent Orange Act of 1991, veterans had to prove that their cancer or heart disease or diabetes was linked to their wartime service, a nearly impossible standard. With the act, Congress established a list of diseases presumptively linked to wartime service in Vietnam and set up an evidence-based process for adding to that list. « Compensation decisions are related to the moral obligation to protect our veterans, » Dr Ramos said. So it is important for the VA to consider a range of studies rather than just one — even a relatively good one, like the Ranch Hand study. « NO one conclusion ever made by an expert has strictly relied on one study, » Dr Ramos said. Mr Ferguson concedes that at least some of his fellow veterans’ illnesses may be linked to Agent Orange. But he says there may be other causes as well. Most troops in Vietnam smoked cigarettes, he said, and some also used illegal drugs. He is NOT sure where he would draw the line, but he can’t escape the feeling that some of them are trying to milk the system. « We who spent hours with this stuff daily; we aren’t sick, » Ferguson said.